The Union of South Africa introduced its first coinage in 1923. The reverse of the farthing depicted sparrows, the only wildlife design of the set. South Africa's farthing of 1923 showed the denomination as "¼ PENNY ¼". From 1926 to 1931, the denomination changed to simply "¼ PENNY". From 1931 onwards, the denomination was given simply as "¼D". Note that the legend "¼ PENNY" also occurs on some farthings of 1931. The halfpenny depicted a ship. South Africa's halfpenny of 1923 to 1926 showed the denomination as "½ PENNY ½". South Africa's penny shared its ship design with the halfpenny. The penny of 1923 and 1924 showed the denomination as "1 PENNY 1". From 1928 to 1930, the denomination changed to simply "PENNY". From 1931 onwards, the denomination was given simply as "1D". Paul Kruger's South African Republic, known informally as the Transvaal Republic to English speakers, was eventually defeated and its territory was merged into the Union of South Africa. It never issued a farthing or halfpenny. Southern Rhodesia issued its halfpennies and pennies in cupro-nickel until 1942, after which they were minted in bronze. The halfpenny was 21mm in diameter, whilst the penny was 27mm. Farthings were never issued. The Tudor rose design was the work of Derwent Wood. 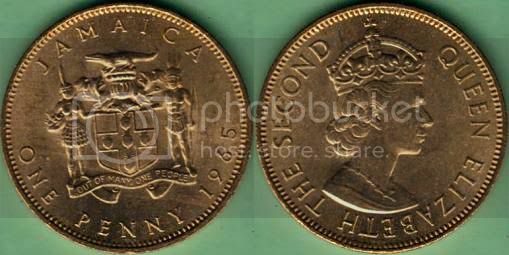 The halfpennies and pennies of Rhodesia and Nyasaland were also non-standard, in that they had a central hole. The halfpenny was 21mm in diameter, whilst the penny was 27mm. Farthings were never issued. The attractive elephant and giraffe designs were the work of English sculptor and engraver Bernard Sindall. Fiji was another country whose halfpennies and pennies had a central hole. Usually they were made of cupro-nickel, but in 1942 and 1943 they were issued in brass. The halfpenny was 21mm in diameter, whilst the penny was 26mm. Farthings were never issued. New Guinea also issued a halfpenny and a penny with a central hole. The halfpenny exists only for 1929, but most of the issue was later melted down, with only a few pieces being sold in sets. Both denominations were minted in cupro-nickel in 1929, but from 1936 the penny was minted in bronze. The penny had a diameter of 26.7mm. A farthings was never issued. New Guinea was one of the few countries to issue coinage in the name of Edward VIII in 1936. The halfpennies and pennies of British West Africa (a currency union, not a country) had a central hole and were made of cupro-nickel until 1952, when they were issued in bronze. They were similar in size to their UK halfpenny and penny counterparts. Farthings were never issued. Coinage in the name of Edward VIII was issued in 1936. Nigeria issued a holed halfpenny and penny after independence. Previously it had used the coinage of British West Africa, a currency union. The halfpenny was 21mm in diameter, while the penny was 28mm. A farthing was never issued. Zambia issued a holed penny after independence. It was 27mm in diameter. A farthing or halfpenny were never issued. Malawi also issued a penny after independence. It was also 27mm in diameter. Although it was not holed, its very basic design was very similar to that of Zambia's penny. A farthing or halfpenny were never issued. Ghana issued a halfpenny and penny after independence. The African star of freedom, also featured on Ghana's flag, appeared on the reverse of all the coins. The halfpenny was 21mm in diameter, while the penny was 25.5mm. A farthing was never issued. The Gambia issued a 1966-dated penny after independence. A farthing or halfpenny were never issued. The penny, which was 25.5mm in diameter, depicted a yacht on the reverse. Though the country had become a republic, Elizabeth II was portrayed on the obverse in her capacity as Head of the Commonwealth. Jamaica as a British colony issued a farthing, halfpenny and penny, but no other denominations. The farthing and halfpenny were introduced during Queen Victoria's reign, with the same reverse design as shown above. The coins were issued only in cupro-nickel until the reign of George VI, from which time they were minted in nickel-brass. Apparently the Jamaicans disliked bronze and copper coins. The motto of the seal has been a matter of discussion for years since inception. The original motto, INDVS VTERQVE SERVIET VNI is the Latin translation for "The two Indians will serve as one", or rather "Both Indies will serve Together", in reference to the collective servitude of the Taino and Arawak Indians to the colonizers. The motto was later replaced with the English motto "Out of Many, One People", as tribute to the unity of the different cultural minorities inhabiting the nation. Perhaps as coincidence, the motto has the same meaning with the motto of the United States; E Pluribus Unum. Before the reign of George VI, the diameter of the 20th century coins was: farthing - 20.2mm; halfpenny - 25.3mm; penny - 30.9mm. With the reign of George VI, the inner circles were removed from the obverse and reverse of the coins, which were now minted in nickel-brass. The penny was reduced in size to 27mm in diameter, whilst the halfpenny was reduced to 22m in diameter. The farthing retained a diameter of 20.2mm and was last issued in 1952. 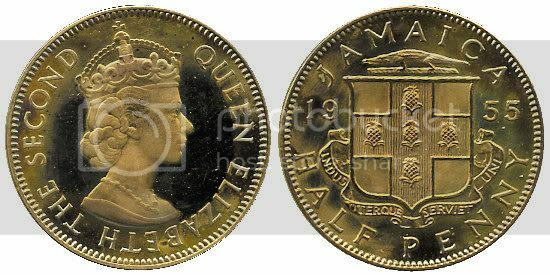 In the reign of Elizabeth II, only the halfpenny and penny were issued, and in 1964 two supporters were added to the coat of arms: a male and female Taino (Arawak), representing the original Amerindian inhabitants of the island. 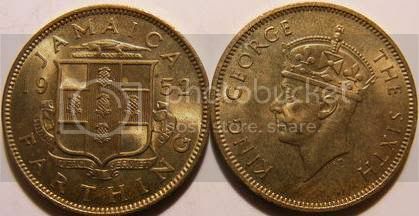 In 1969 a commemorative penny and halfpenny were minted to celebrate the centennial of Jamaican coinage. All the Jersey images here are from Harold Fears' Jersey Coins and Banknotes web site. It is well worth a visit. In Jersey in the 20th century, 1/24th of a shilling was equivalent to a British halfpenny, and it matched its British counterpart in size, shape and metal. The reverse of the coin depicted the state arms, but it was amended three times in the reign of George V. The reverse design dated 1931 remained for the rest of the coin's life - only the date changed. 1/12th of a shilling was equivalent to a British penny, and it matched its British counterpart in size, shape and metal. The arms were amended throughout the reign of George V (see previous images), but remained unchanged in the reigns of George VI and Elizabeth II. This version was issued in 1949 to commemorate the liberation of the island from the Nazis. This coin commemorates Charles II, who became king of England in 1660. He made two visits to the island during the English Civil War. This coin celebrates the 900th anniversary of the Norman Conquest. The Queen's title in Jersey is "the Duke of Normandy" (yes, Duke - never Duchess). Apart from Jamaica, I know of no other territory that has issued commemorative pre-decimal pennies or penny equivalents. The currency of Guernsey, another Channel Island and British crown dependency, was influenced by French currency, and it ended up with a currency unit called "the double" (from "double denier"), which was pronounced "dooble". There was a one double coin, which was not minted after 1938; a 2 doubles coin, equivalent to a British farthing and last minted in 1929; a 4 doubles coin, which equalled a British halfpenny; while the 8 doubles was equal to a penny. The reverses of the 1, 2 and 4 doubles were originally similar (only the denominational numeral was different), whilst the 8 doubles sported a wreath. Note the old-fashioned spelling of Guernsey: "Guernesey". In 1956, the designs of the coins were updated. The 4 doubles featured a single Guernsey lily, while the 8 doubles depicted an arrangement of lilies. The obverse showed the state arms. The monarch was not depicted on the obverse of Guernsey's coinage until 1985. 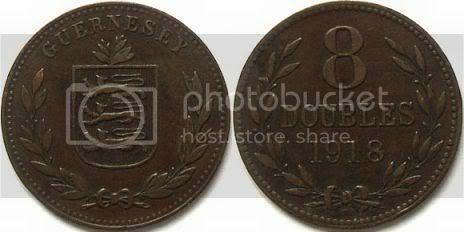 Jersey and Guernsey each had a threepence coin. That was their highest denomination, but this was not a problem, since a full set of UK coinage also circulated on the islands. 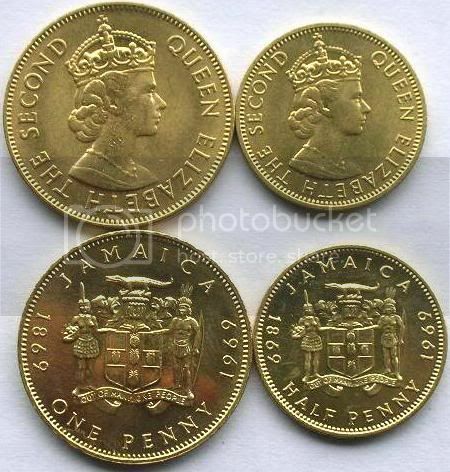 In 1971 both Jersey and Guernsey went decimal and introduced a full series of their own coins, denominated in pence and pounds, and the old names ("double", "1/12th of a shilling") disappeared. The colonial penny predates the 20th century, of course, as can be seen from these pennies of Bermuda and the Bahamas. There were many penny tokens, too. These tokens from Lundy Island, an English island in the Bristol Channel, were actually used in the local tavern. They were designed and minted by Martin Coles Harman, the owner of the island. The puffin was a common bird on the island, so he used it to make a humorous reference to the British penny and halfpenny. He was eventually fined for illegally minting his own currency. That finishes my brief survey of the low denominations. I had never noticed it before, but perhaps the early South African farthing and halfpenny, first issued in 1923, depicting sparrows and a ship respectively, inspired the designers of the British farthing and halfpenny of 1937, which depicted a wren and a ship respectively?